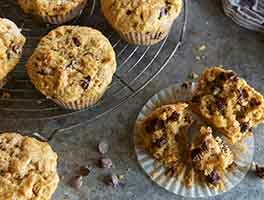 White whole flour adds a nutty sweetness to these luscious chocolate chip muffins. 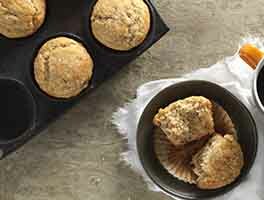 *Add a little extra zing to your muffins with a complementary flavor: cinnamon and coconut extra-strong flavors are both good choices. Start with 1/8 teaspoon, adding more to taste. Preheat the oven to 350°F. Lightly grease (or line with muffin cups, and grease the muffin cups) a 12-well muffin pan. Beat together the butter, sugar, baking powder, salt, vanilla, and flavor (if you're using it) until fluffy. Beat in the eggs, then stir in the milk. Mix in the flour, then the chocolate chips. Spoon the batter into the muffin cups; they'll be quite full. Sprinkle each muffin with a little sparkling sugar. Bake the muffins for 30 minutes, or until a cake tester inserted into the center of one comes out without crumbs clinging to it (a little chocolate is OK!). The white whole wheat flour is the secret ingredient to the best chocolate chip muffins I've ever had. My only complaint is that the muffins were very dense. I used the fluff and sprinkle method to measure the flour, but I added a LOT of milk to the second batch and they turned out better that way. This is a great recipe. It went together easily and produced muffins that didn't fall apart coming out of the tin. Stable when cool, good for lunch box or commuter. I made a half batch, with a little less than the recommended amount of chocolate chips with what I had on hand, which were plenty enough. 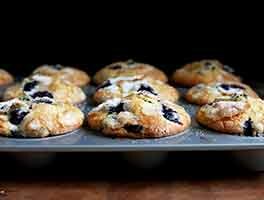 i always make your blueberry muffins and decided to try these. i used almond milk. would that change the recipe? they were good but not outstanding like the blueberry muffins. i added 1/8 t cin. where did i go wrong? beleive me they are edible but i feel they are missing something. thanks!! love your recipes. I baked this recipe exactly as written, using 1/2 teaspoon cinnamon. The flavor was great and they were moist. However, they turned out rather flat and as much as I like chocolate, if I baked them again I would reduce the amount of chocolate chips by 2-4 oz. I recently made the Department Store Blueberry muffins and they were fabulous. Everyone liked how moist they were, so given this recipe is so similar I assumed I would have similar results. The only difference is the type of flour, and unfortunately it was problematic. No complaints on the taste, and I like the healthy aspect of white whole wheat, but the texture was very dry. I even baked them 5 minutes less. Not sure where it may have gone astray, but next time I think I will use 1/2 white whole wheat, and 1/2 AP flour-- maybe add in a tablespoon of a mild olive oil? Thoughts? 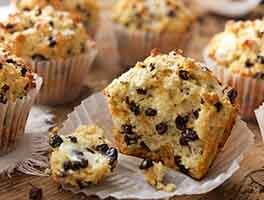 These muffins are amazing! 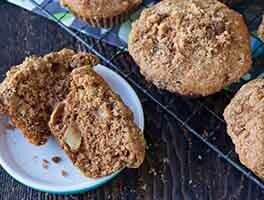 I followed the recipe exactly and now plan to bake these often as a substitute for the bakery muffins that my husband loves. 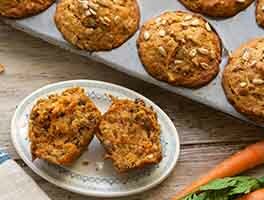 The original recipe bakes up wonderfully, is super easy, and I could easily see adapting the base recipe for fruits, nuts, and even subbing out some of the oil to slowly but surely give him a palatable and healthy breakfast option. Baked these last night. I subbed buttermilk for half the regular milk, as I had some to use up. Added a teaspoon of coconut extract along with the vanilla. Used mini chocolate chips as that is what I had on hand. They came out delicious and not at all dry. My very picky teenage son even liked them, lol. My only complaint is that they baked up small and rather flat. Wonder if it was the buttermilk or the lack of baking powder in the recipe? I just ordered the white whole wheat flour, but I was wondering if it doesn't come in time (I am baking for a party this weekend) what can I use as a substitute? Thanks!